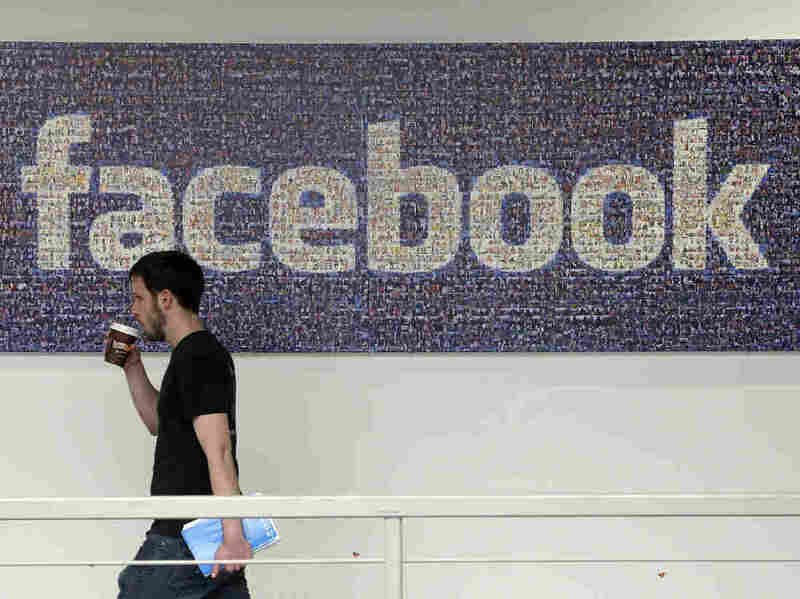 Facebook and a top Republican Senator have responded to allegations from the tech website Gizmodo that Facebook is suppressing ideologically conservative news or stories from conservative organizations from its “trending topics” column. According to an article Gizmodo published on Monday, Facebook wasn’t just relying on algorithms to determine which stories made it onto the list of developing news on the right-hand side of its homepage. The article alleged that contracted employees called “human curators” helped decide what stories appeared, and that it “often depended on the taste of individual supervisors — some of whom were said to favor liberal causes such as Black Lives Matter,” reports NPR’s David Folkenflik for All Things Considered. Some of these topics included the disappearance of Malaysia Airlines flight MH370 and the Charlie Hebdo attacks in Paris, the article said, also citing Black Lives Matter and the conflict in Syria as other subjects that former curators said were “injected” into the module. For Facebook detractors, Facebook’s bid to expand the social media platform’s influence using video makes the allegations regarding the company’s methods for sorting trending topics even more problematic. David reports that on Tuesday afternoon, Facebook told NPR that it will review its practices more deeply and address the Senator’s questions. Carlos Santana has just returned with a new album featuring his original band, which split up in 1972 — including guitarist Neal Schon and keyboardist Gregg Rollie (both of whom left to form Journey), Michael Shrieve on drums, and Michael Carambello on percussion. In this episode of World Cafe, Carlos Santana tells the story of how the group’s new album, Santana IV, came together. He also discusses the new instrumental “Fillmore East,” which was influenced by the legendary music venue. For decades, the medical aid group Doctors Without Borders has been known for going places many other aid groups won’t. But several times over the past two years its facilities have been hit by airstrikes in Syria, Yemen and Afghanistan. And now the group must adapt to a more threatening world. Michiel Hofman began working with Doctors Without Borders, known internationally as Médecins Sans Frontières (MSF), in 1992 in Liberia. Over the years, whether it’s been in Bosnia, Chechnya or South Sudan, the senior adviser for security and operations says its clinics and staff have come under small-scale attack, such as looting and burning. Hofman says that’s part and parcel of working in a conflict zone. But he says over the last few years there’s been a dramatic increase of aerial attacks on its clinics or hospitals it supports. Those have been in Yemen, Syria and Afghanistan, on civilian medical facilities that should be untouchable under international humanitarian law. Hofman says when there are ground attacks, MSF officials usually know who is responsible and can negotiate with local commanders. “With these aerial attacks … it’s much more difficult to know who we actually [need to] talk to about this,” he says. Take Syria, for example. With so many nations involved in the fight, it’s hard to know for sure who is responsible for a particular attack. Hofman says his organization is pushing all countries to adhere to international law protecting health facilities. He says it’s hard to keep staff if they don’t know they’re protected. “A lot of our ability to operate is based on trust — the trust of the medical staff that we ask to work there, but also trust by the patients that these hospitals are safe places,” he says. He points to staff at the MSF hospital in Kunduz, Afghanistan which agreed to continue to work even after the town was captured by Islamist militants. In October 2015, the facility was bombed by U.S. forces. 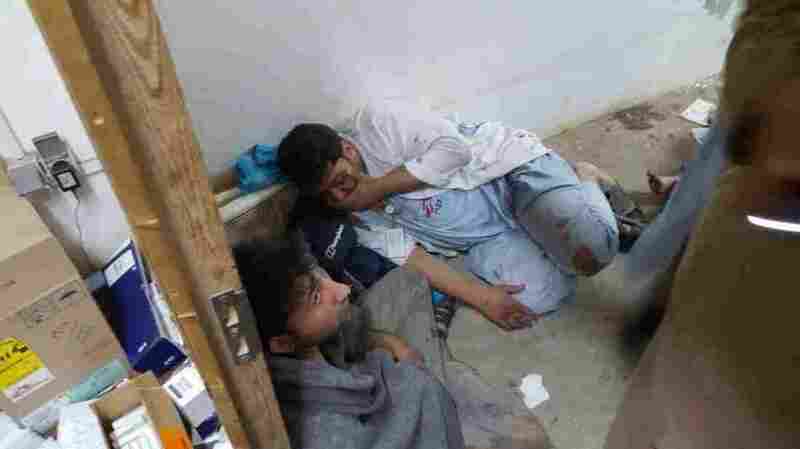 MSF says at least 42 people were killed in the attack, including 14 staff members. Hofman says employees felt their trust had been violated. He says there has also been a recent demonstration in a neighborhood in southern Syria against MSF reopening a bombed facility. “The population didn’t want a hospital to be reopened because they were afraid their town would be targeted if there was a hospital in that location,” he says. Airstrikes aren’t the only threat that’s increased. Hofman says in almost every ongoing conflict in the world, abduction has become a routine strategy of warring parties. Security measures that didn’t exist before are now actually related to mitigating or preventing the risk of abduction. As MSF has expanded its operations, it’s become better known worldwide, says Hofman. Kidnappers looking for money or headlines target the group’s medical workers from the international community. To mitigate the risk, sometimes MSF uses just local workers, he says. But he says there are certain programs that can’t be done without international staff. The aid agency also restricts its workers’ movements with things like curfews, or it might even pull out of a country. What it still won’t do is use armed security. “Those people who can provide you with armed protection are always connected to one or the other party in a conflict. Which means as soon as you accept an armed party, you become a legitimate target for the other side of that conflict,” he says. Hofman says it’s critical that MSF — like all humanitarian aid agencies — remain impartial. That includes never turning away a patient, no matter which side he or she is on. The Citadel, the Military College of South Carolina, says it will not allow an admitted student to wear a Muslim headscarf. The woman’s family is considering legal action, according to a Muslim advocacy group. Despite not allowing the student to wear hijab, Rosa says he hopes she will attend in the fall. Ibrahim Hooper, spokesman for the Council on American-Islamic Relations, said the student cannot attend without the accommodation. “Wearing hijab is viewed as a religious obligation,” he told NPR via email. CAIR said in a press release that it is “considering legal options to challenge” the decision. “It’s not just a religious issue, but it is a feminist one because they are women,” says Hafez, an associate professor of gender and sexuality studies at the University of California, Riverside. 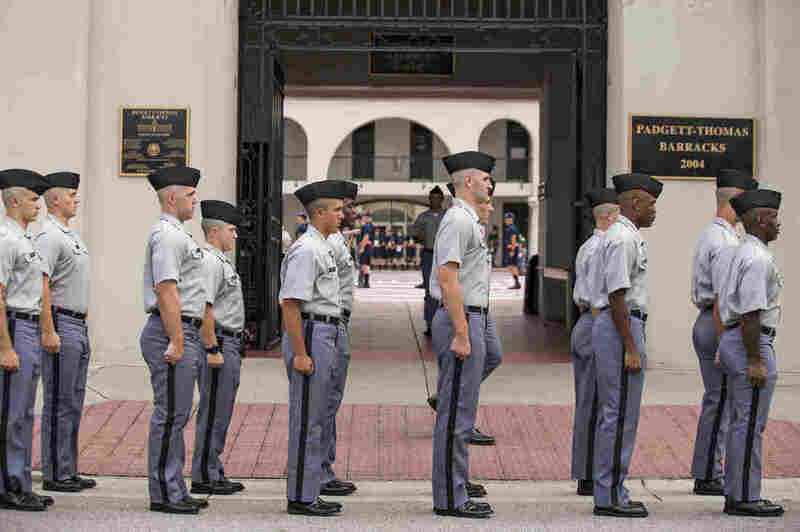 The Citadel, which is a public college, admitted its first female cadet in 1995. (Though that required a legal battle, as The Los Angeles Times reported, and she dropped out a week after winning the fight.) The military college says that “much has changed since 1995,” and wrote in 2005 that women are now more integrated into the Cadet Corps. Pinelli was reportedly punished for publicly mentioning the situation, the South Carolina Post and Courier says, though the school declined to comment, citing privacy law. What could be more American than standing in a backyard at a barbecue while holding a beer on the Memorial Day weekend in the United States? Budweiser thinks it has the answer: Holding a beer called America. The temporary renaming, to be accompanied by cans and bottles adorned with U.S. icons such as the Statue of Liberty, phrases from the Pledge of Allegiance and lyrics from “America the Beautiful” and “The Star Spangled Banner,” also coincides with the Rio 2016 Olympic and Paralympic Games. The marketing effort sent both Budweiser and “America” trending on Twitter in the U.S. Tuesday, with social media users reacting in befuddlement and amusement. “Pretty cheeky for Budweiser to rename its beer ‘America’ considering it’s now a Belgian company,” tweeted T.C. Sottek (@chillmage), the managing editor of technology news site Verge. Budweiser is owned by Anheuser-Busch InBev, a company headquartered in Belgium. “‘No officer I am not drunk, I’ve only had 15 Americas. Are you really going to arrest me for enjoying some nice cold freedom?’ @Budweiser,” tweeted Meme (@ArturoChaidez). Like other news outlets, NPR is being paid by Facebook to produce these livestreams, a business arrangement that NPR has disclosed in only the broadest of terms. I’ve since heard pointed questions wondering what kind of further disclosure NPR needs to make about the arrangement, including what disclaimers, if any, NPR needs to make, either within the context of the videos themselves or when NPR covers Facebook as a corporate and cultural entity. Since Facebook is in the news, the issue seems particularly timely. NPR announced the new live video effort on May 3. The post noted, “Facebook will provide some technical and financial support, but the company will have no role in the content of the videos.” Internally, NPR’s newsroom staff was told the arrangement is a “collaboration.” A publicly posted memo from NPR’s training team does not mention a financial arrangement (although perhaps it should not, since, as NPR’s standards editor Mark Memmott notes, that guidance is there for NPR journalists). 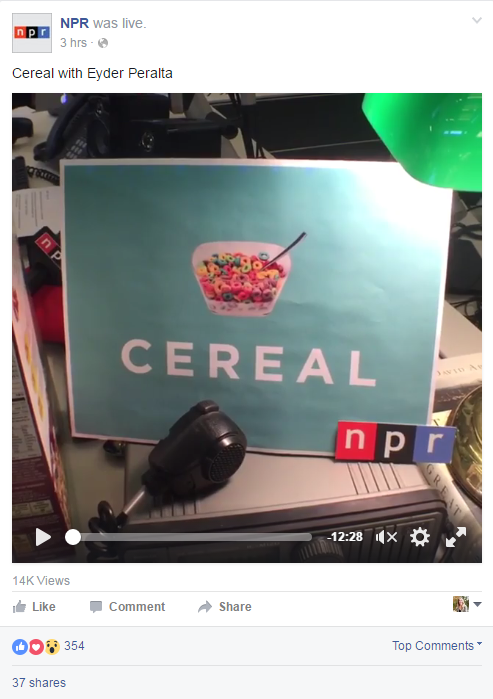 From NPR’s point of view (and mine), there is a lot to like about Facebook Live. 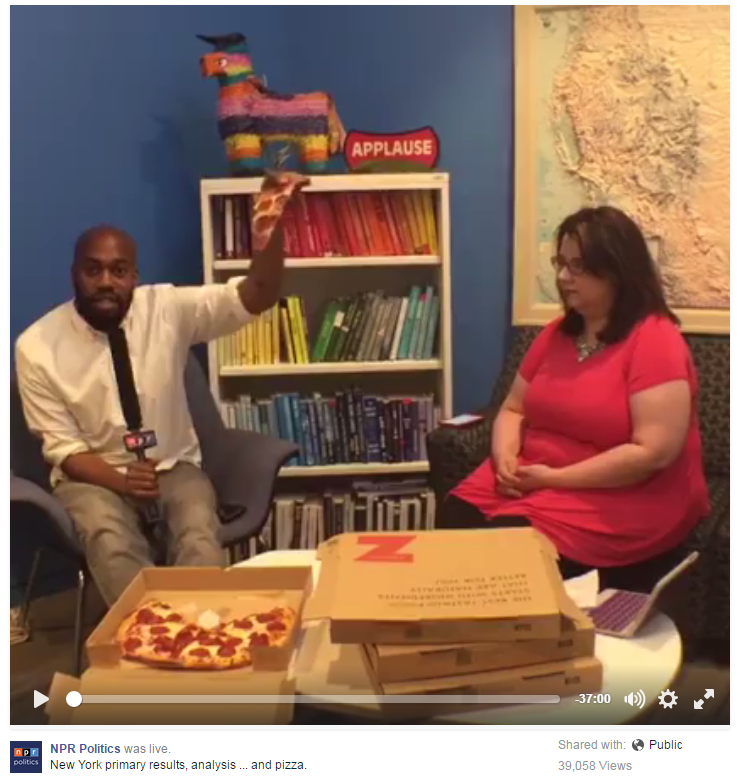 Reporters can take the audience along as they report, show off behind-the-scenes goings-on (is disclosing reporters’ pizza toppings on primary night a form of transparency?) and answer questions in real time. NPR already has a robust presence on Facebook, but as the social media platform, and video, capture more and more attention from news consumers, NPR will want to be there, even if live video seems a bit far afield from its origins in radio. I don’t know any specifics about the financial arrangements between NPR and Facebook that are supporting this push into video, including how much NPR is being paid. But if the financial and technical support is substantial, I’d argue that the archived videos themselves should likely carry some sort of disclosure about Facebook’s financial support. Meanwhile, Memmott said, NPR stories about Facebook’s corporate interests will disclose that NPR is receiving financial support, as did this afternoon’s piece from David Folkenflik. The arrangement is in its early days, so it makes sense that not everything is sorted out. When I hear more from the newsroom on this issue, I will update this post. The Food and Drug Administration is re-evaluating its definition of what counts as a “healthy” food. The change comes as healthfful fats — including fats found in nuts — are increasingly recognized as part of a good diet. Currently, if a food company wants to put a “healthy” claim on its label, regulations stipulate that the food can contain only 3 grams of fat per serving. This means that many foods that include nuts don’t qualify as healthy. The FDA says that in light of evolving nutrition research, it is now planning to solicit public and expert comment to come up with a new definition that will help consumers make informed choices. 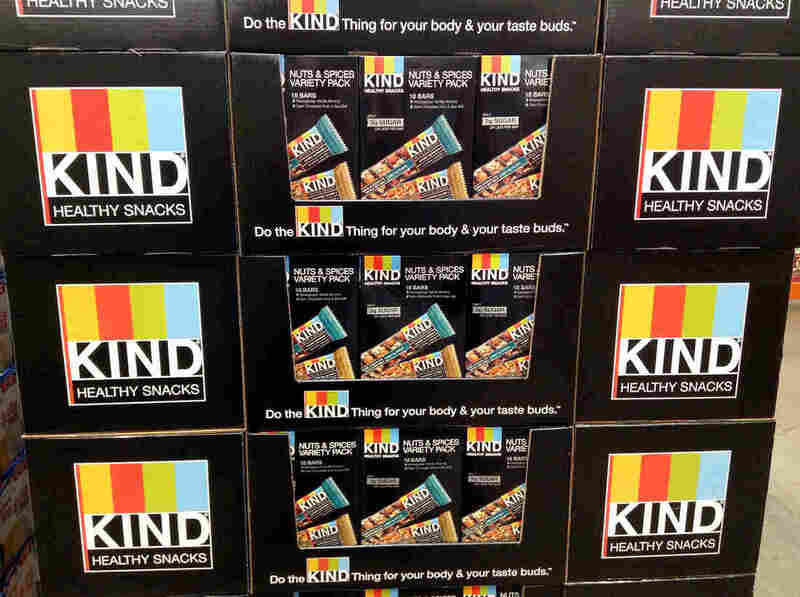 The move comes after the maker of Kind brand bars — which contain almonds and other nuts — pushed back against an FDA complaint about its used of the phrase “healthy and tasty.” After making its complaint, the FDA now says that, after reviewing the situation, it is comfortable with the company using the phrase. “We are pleased that the FDA is looking into” revising its definition, says Daniel Lubetzky, the CEO of KIND bars. The company helped launch a citizen’s petition requesting that the FDA take action. As we’ve reported, many new studies affirm the healthfulness of eating more plant-based fats – such as avocados, eggs and nuts. And the dietary guidelines, which were updated earlier this year, recommend eating foods rich in healthful fats. Miami Beach is one of the nation’s cities most vulnerable to climate change — and its leaders are doing something about it. The city, a national leader in addressing climate, has begun to make improvements aimed at protecting residents from rising sea levels. In South Florida, the rate of sea-level rise has tripled over the last decade, according to a new study from the University of Miami. The rising seas raise questions for many about whether the resort community has a future. Officials there say the answer emphatically is yes and they’re moving ahead with plans for a resilient city. Over the last decade, flooding during high tide in this and other neighborhoods along Miami Beach’s western edge has become a regular occurrence. The University of Miami study confirms that the main reason for the increased flood events is sea-level rise. While some elected officials, including Florida’s Republican Gov. Rick Scott, aren’t ready to acknowledge the threat posed by climate change, here in Miami Beach, it was an issue that helped get Levine elected. “I think I did a campaign commercial in a kayak,” he says. 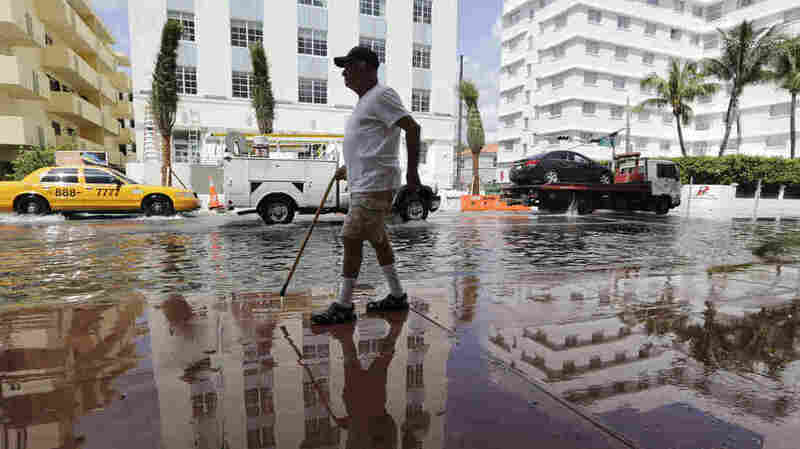 Levine took office on a pledge to build a resilient Miami Beach, one that would recognize and adapt to climate change. He holds up Sunset Harbor neighborhood as a model. The patio outside a restaurant and café is a cozy spot that’s now more than three feet below street level. The street was “literally rebuilt, raised and built higher,” he says. “And of course major pumps were installed as well. So now you have certain buildings that are lying lower, but the streets are higher.” This neighborhood, perennially wet during seasonal high tides, now is dry. To combat flooding, Miami Beach has launched a $400 million project that’s begun installing as many as 80 pump stations throughout the city. In addition, more roads on the island’s low-lying western edge will be rebuilt higher. 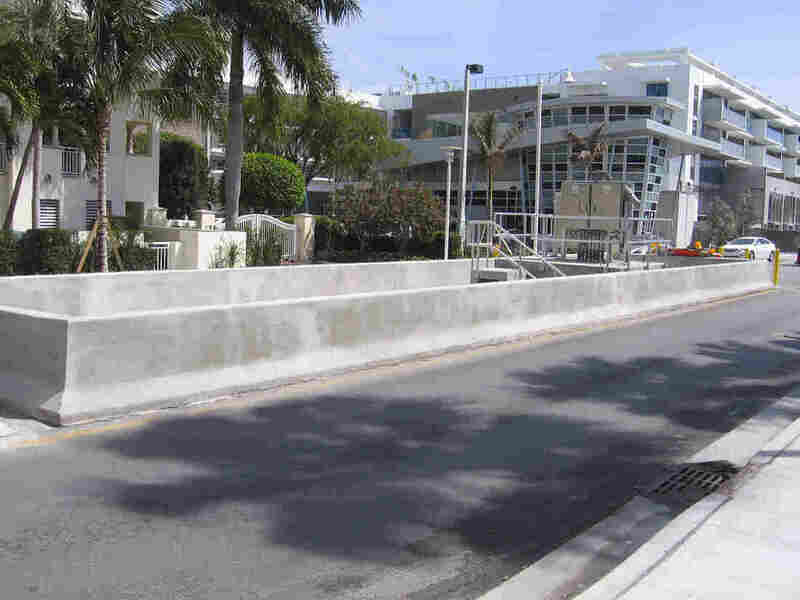 City engineer Bruce Mowry is now focused on Miami Beach’s next big project: the reconstruction of Indian Creek Drive, a road that saw severe flooding last year during a seasonal high tide. Former Vice President Al Gore took a tour and later talked about seeing fish swimming in the street there. The street runs alongside a lagoon. “We had as much as a foot of water over the seawall,” Mowry says. To make sure that doesn’t happen this year, he says Miami Beach will rebuild Indian Creek Drive higher and raise the height of the adjoining seawall. “That seawall will end up being about four to five feet higher than it is now. Two blocks up here, we’re planning on putting in a pump station right here and collecting all the water,” he says. It’s a $25 million project and perhaps surprisingly, after negotiations with the Scott administration, 80 percent of that cost is being picked up by the state of Florida. We need to set aside sort of the political nonsense about the debate about whether climate change is happening and embrace our problem and start developing comprehensive strategies. Ben Kirtman, a climate modeling expert at the University of Miami, says it’s encouraging the state finally signed on to the project, but it took a lot of negotiation. Kirtman is one of the Florida scientists who has worked to convince Gov. Scott to acknowledge and begin planning for climate change — so far unsuccessfully. 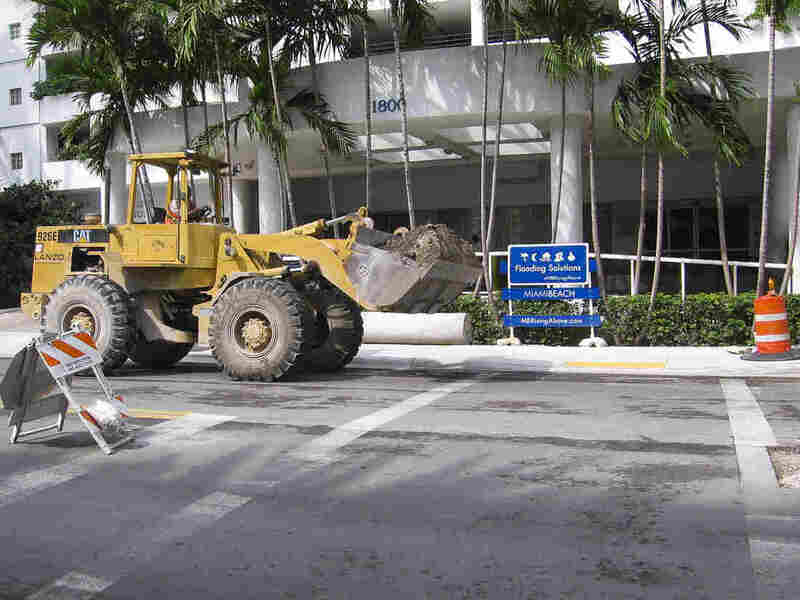 Kirtman thinks by working to build a resilient city, officials in Miami Beach are on the right track. “I’m quite optimistic that there’ll be a Miami Beach 50 years, 100 years from now. But we need to set aside sort of the political nonsense about the debate about whether climate change is happening and embrace our problem and start developing comprehensive strategies,” he says. At current rates of sea-level rise, Levine believes the work underway now will buy the city at least 50 years. By then, he hopes innovation may begin providing long-term solutions and make the city a model for the nation. While others see only a gloomy future for low-lying coastal cities, Levine is a picture of confident optimism. Levine and Kirtman say building resilient cities is just the first step. The real challenge is to build the political will to address climate change and slow rising sea levels before elevated structures, pumps and seawalls are no longer enough. These planets beyond our solar system – exoplanets — were discovered with the help of NASA’s Kepler Space Telescope, which launched in 2009. Kepler was designed to search for planets by staring for years at over 100,000 stars. Whenever a planet passed in front of a star and blocked some of its light, Kepler would see a telltale dimming of the starlight. But to make sure that dimming really was caused by a planet, scientists would have to do follow-up observations with other telescopes. “The process of verifying a candidate as a true planet has traditionally involved detailed, in-depth study on a case by case basis,” says Timothy Morton, a researcher at Princeton University. Trouble is, that takes time and a lot of effort. So Morton developed a new, automated technique that let him quantify the probability that a Kepler signal was really a planet — without having to do those cumbersome follow-up observations. Now he and his colleagues have published evidence, in the current issue of The Astrophysical Journal, showing that a slew of Kepler’s observations have more than a 99 percent probability of being real planets. “This is the most exoplanets that have ever been announced at one time,” says Morton. And it more than doubles the number of verified planets discovered by the Kepler telescope. Based on size, nearly 550 could be rocky planets like Earth. And 9 of them orbit in their star’s “Goldilocks Zone” — the region around a star that’s not too hot or too cold for liquid water — and maybe even life. 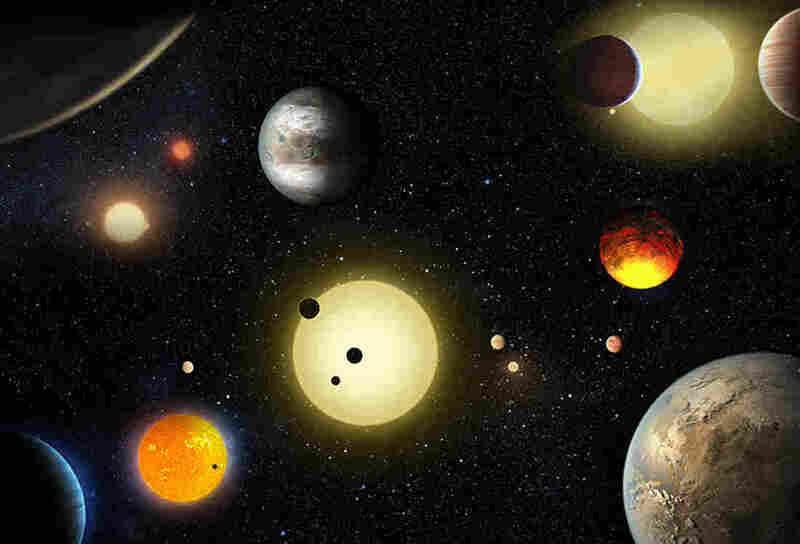 Previously, the Kepler team had only known of a dozen such planets. In addition to the 1,284 newly verified planets, Morton’s analysis shows that an additional 1,327 candidates spotted by Kepler that are more likely to be planets than not — but they need more study for confirmation. Natalie Batalha, the Kepler mission scientist at NASA’s Ames Research Center, says the space telescope is giving researchers a real sense of what kind of planets are out there. “You’re talking about tens of billions of potentially habitable, Earth-size planets out there in the galaxy,” she says. Next year, NASA is planning to launch another space telescope called TESS. It will be similar to Kepler but will search the entire sky to find Earth-like planets around closer, brighter stars. Astronomers should have an easier time studying those planets to learn more about what they’re like and whether they might be right for life. In a blow to the coal industry, a new terminal in the Pacific Northwest was denied approval after opposition from environmental groups and a debate between local Native American tribes.